THESE STICKS ARE BUILT TO LAST! Each stick is made of the finest polyethylene shaft, uniquely oval-shaped to provide better and safer stick control. Each shaft is further reinforced with two structural "I" beam ribs allowing for total flexibility without shaft fatigue. At the end of every stick is a unique anti-slip hand grip, designed to cushion impacts and prevent injuries. The Supersafe blades, molded directly onto the shaft, are made of Skinex (integral skin polyurethane), giving a very tough but flexible outer shell with a spongy core. The skin will not wear or peel away and the blade will never mark or damage any floor. 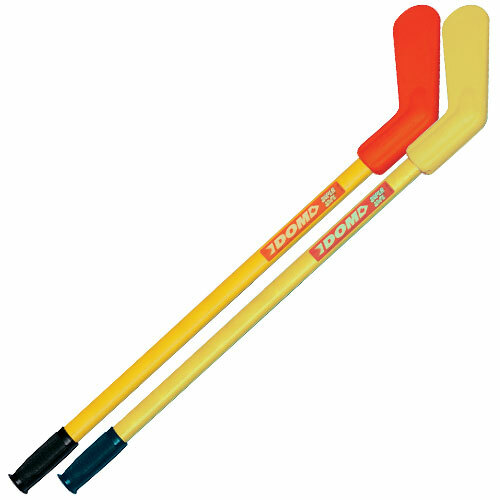 Includes 6 orange, 6 yellow 30" sticks, 2 Supersafe pucks and 2 vinyl balls.